Gill Park is located directly north of the Clubhouse. 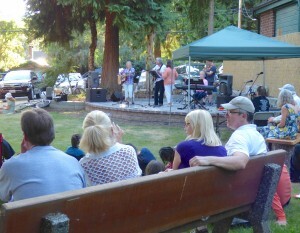 It is a treed and grassy park with an outdoor stage and a few benches. Some chairs and tables stored inside the Clubhouse are also be available for use at the park. Must reserve since park may be in use by community members. Rental rate for Gill Park is $100. A $50 damage deposit is required. Same terms and information as Pavilion Rental.